Australia thrashes New Zealand - lifts WC - and Kiwis react so well !! The World Cup extravaganza that started on Feb 14 has culminated – Australia are the undisputed champs ! NZ started that day with a bang scoring 331 and defeating Sri Lanka. Mccullum excelled with innovative aggressive field settings and more aggressive batting throughout – though all their matches were played in their own country, before this one at MCG. Baz, the performer said - "We had Martin Crowe and John Key, our prime minister, in the changing room just before and they are incredibly proud of what we have able to achieve as well and they are just a couple of guys that we have been able to share it with and we have shared this with the whole country. It would've been nice to have won it but we are proud of what we have been able to achieve." New Zealand captain Brendon McCullum maded no excuses for his side's heavy Cricket World Cup final defeat to Australia in Melbourne, simply shrugging his shoulders and saying "the best team won". New Zealand were rolled for 183 after winning the toss and batting at the Melbourne Cricket Ground, Australia completing a one-sided victory by chasing down the target for the loss of three wickets and with 16.5 overs to spare on the back of half centuries to retiring skipper Michael Clarke (74) and captain-in-waiting Steve Smith (56 not out). It was the ultimate anti-climax to a thrilling tournament. McCullum must have been hurting but he was gracious and in no mood for excuses. 547 Runs scored by Martin Guptill in the 2015 World Cup, the most by any batsman in the tournament. He is the only New Zealand batsmen to score 500-plus runs in a single World Cup. Scott Styris scored 499 runs in the 2007 edition. 0 Runs scored by Brendon McCullum in this match, the lowest by any captain in a World Cup final. No other captain has scored a duck in a World Cup final, with the previous lowest being Clive Lloyd's 8 against India in the 1983 final. From setting 5 slip cordon to smashing an 18-ball fifty, Brendon McCullum has taken the team along – not today – he alongside Corey Anderson and Luke Ronchi - failed to trouble the scorers proved a mountain too high to climb. It was New Zealand's worst nightmare realised, the World Cup reduced to a fizzer in front of 93,000 at the Melbourne Cricket Ground. New Zealand were not undone by the boundary sizes or their first trip across the Tasman, they were simply and plainly outplayed by an Australian side operating a level above all their rivals for most of this magical tournament. This wasn't supposed to be how it finished. Seven weeks of rollicking entertainment, replaced by a below par effort on the day when it counted most. But the Nation and their Press is hailing them ‘welldone’ for the performance thus far and not criticising too heavily for the poor show in the finals. India's exit from the World Cup with a crushing 95-run defeat to Australia should be neither surprise nor shock. It was the conclusion of a World Cup campaign that was built on thin ice given the team's limitations and its ability to skate lightly over them. Following a miserable two months in Australia, the team did exceptionally well winning 7 matches bowling out their opponents before losing in the Semis. The fans reacted with dismay, hurtling abuses, making comedy of Virat Sharma’s personal life. 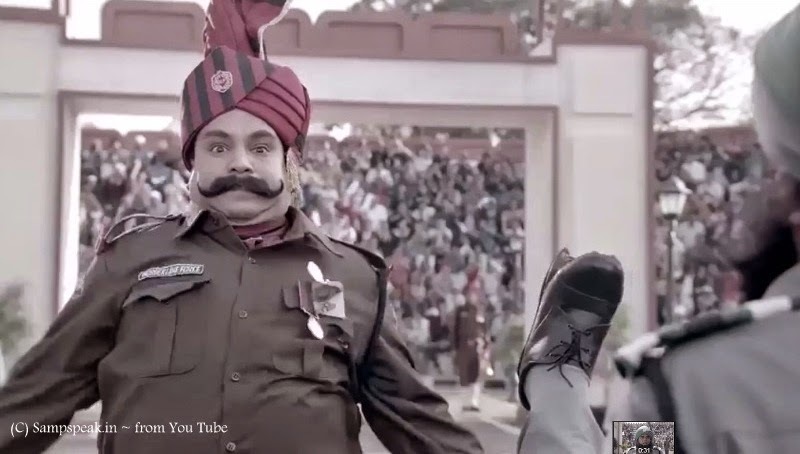 Worser still, security was beefed up at captain Mahendra Singh Dhoni’s residence. Every event offers lot of learning ~ India is the biggest democracy and follow Cricket crazily ……. India bows out of World Cup ~ some earlier matches !! Perhaps one should not be logging on to FB or Twitter – flooded with messages ridiculing the loss. It is easy to stand by a team that is winning ! Before the start of the tournament, not many would have thought of India making to the Semi-finals, that too with 7 consecutive wins and bowling out all their opponents. It was not to be today – the 95-run loss to Australia in the semi-final halted India’s ICC Cricket World Cup, 2015 campaign. Chasing 329, the MS Dhoni-led side were bowled out for 233 at the Sydney Cricket Ground. It was a classy display by Aussie. This morning started with hope when David Warner got out – but the stand between Finch and the classy Steven Smith took the game away. At one stage it threatened that they might get closer to 400 even – that wan undone by some good bowling – in the end, we all know that chasing 329 would never be easy. The end came in front of a crowd who had made this most historic of Australian venues seem like Little India. Indians had lost three times to Australia this southern summer – two Tests and a Tri Series ODI – and today it was sort of surrender. Umesh Yadav bowled really fast clocking 149.2 kmph even. He took 4 wickets too – Ashwin bowled well – still Steven Smith's century followed by James Faulkner and Mitchell Johnson’s (27 off 9) cameos ensured that they set India a formidable target. The opening was scratchy. Shikhar Dhawan's brisk 45 helped a good start and perhaps the only time, when we thought that India was well on chase. After reduced to 108 for four, it was an uphill task; While Ajinkya Rahane and MS Dhoni added 70, India couldn’t keep pace with the creeping run rate and also lost wickets at regular intervals and were bowled out by the Mitchell Starc-led attack. Aussies outplayed us and deservingly won. The scores in brief : Aus 328/7 in 50 overs (S Smith 105, A Finch 81, U Yadav 4/72, M Sharma 2/75) beat Ind 233 all out in 46.5 overs (MS Dhoni 65, J Falukner 3/59, M Starc 2/28, M Johnson 2/50) by 95 runs. In the morning as Smith batted, the thoughts of 2003 WC Final was haunting. At New Wanderers on 23rd Mar, Aussies were off to a brisk start – Gilchrist (57); Hayden (37); Ricky Ponting (140*), Damien Martyn (88*) all made runs as Australia made 359/2. Only Sehwag provided some resistance, then. In 2011, in the QF, Yuvraj's left-arm sliders strangled the batsmen at one end, even as Ricky Ponting soldiered on at the other. Still 261 was a good score. Sachin and Gambhir made 50s, as a good 65 ball 57 from Yuvraj took us to an easy victory. The one win which old-timers still cherish came at Chelmsford on 20th June 1983 in ODI no. 219 in Prudential World Cup. Against an attack of Geoff Lawson, Rodney Hogg, Jeff Thomson and Ken Macleay, India made 247 with contributions of Srikkanth 24; Yashpal Sharma 40; Sandip Patil 30; Kapil Dev 28 & extras 37 ! The batting line-up of Trevor Chappel, Greame Wood, G Yallop, David Hookes, Alan Border, Rod Marsh, Macleay were bowled out for 129 in 38.2 overs. Roger Binny had figures of 8-2-29-4; while Madanlal bettered him with 8.2-3-20-4. 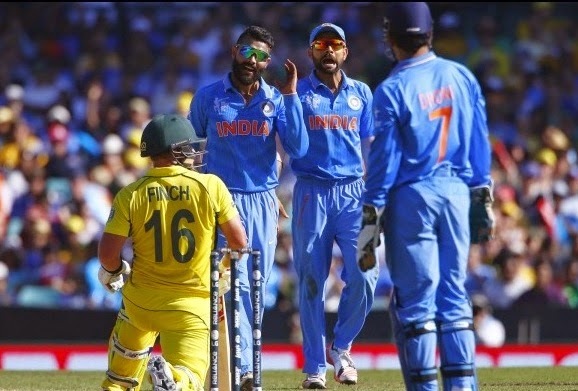 This morning Dhoni displayed his acumen when Finch was adjudged not out – Ravindra Jadeja goaded him into making a review – the ball did hit the stumps – but by the discretionary power Richard Kettleborough continued his decision of ruling the batsman not out ! Aussies did resort to sledging in keeping with their attitude – before the match James Faulkner was quoted as believing that instances of sledging will be inevitable; earlier the confrontation between Shane Watson and Pakistan's Wahab Riaz enlivened the tournament. For Aussies, playing tough, means shouting out expletives. In the end, it was a good tournament for India, notwithstanding today’s huge loss. They used to say – when India plays Pakistan, entire India stops working ! – when Sachin is at the crease, even trains stop !!! – tomorrow, it is no Pak – but India Australia Semi-finals ~ and after 6 WCs, there is no Sachin Tendulkar – the whole India would wait with bated breathe before Television sets encouraging men in blue. In the popular Shankar film “Indian” – one of the hit songs was ‘telephone manipol sirippaval ivala –Melbourne malarpol melliya magala” – though the lyrical reference was to Melbourne, it was elsewhere !! – it is Sydney that is the venue of the match on 26th Mar 2015. Some people collect souvenir spoons when they go travelling, Aussies are used to picking up World Cups at will from 1987, 1999, 2003 and 2007. Only India and West Indies have won the cup more than once. Indians are the defending champions at this tournament; Australia were for the past three campaigns. These are teams that expect success. In 2011, at Ahmedabad, India did win comfortably – Shane Watson and Brad Haddin opened then – now they would come much down in the order in the powerful Aussie line-up. Sydney is not exactly the ground for India. We have won only once out of 13. That win came in the Commonwealth Bank Series - 1st final on 2nd Mar 2008. In that ODI 2688 Aussies made 239/8 in 50 with Hayden top scoring 82. Sachin Tendulkar made a sound 117* - Rohit Sharma made a brisk 66. Way back in 1987, at Chepauk chasing 271 [big total those days] – India had a great start – Sunil Gavaskar fell at 69 making 37; Krish Srikkanth at 131 (making 70) – then the comeback man [debut in ODI and recalled to International cricket !! ]who was a strokeless wonder earlier earned ‘six hitting Sidhu’ scoring 73 with 5 sixers. India from 229/3 slipped badly and with one ball remaining Steve Waugh clean bowled Maninder Singh to win by a single run. UK Court directs Pakistan to pay GBP 150,000 to India as legal fee !!!! On 15th Aug 1947, the Great Nation got its freedom … do you know of the case arising out of transfer of funds across 1600 km approx becoming subject matter of a Court that is situate almost 7000 km away ! ~ Sovereign immunity is a legal doctrine by which the sovereign or state cannot commit a legal wrong and is immune from civil proceedings or criminal prosecution. The doctrine stems from the ancient English principle that the monarch can do no wrong. Sure, you would have read about the news in all dailies of ‘UK Court asking Pakistan to pay GBP 150,000 [Rs. 1.39 crores approx] to India as legal fee’. In a setback to Pakistan, a UK court has directed Pak to pay 150,000 pounds to India as legal fees in the 67-year-old Hyderabad Funds case involving the Nizam's money while terming Pakistan's behaviour as "unreasonable". Holding that Pakistan has no "sovereign immunity" in the case, the Judge ordered the Pakistan High Commissioner here to pay the legal costs incurred by the other respondents in the case relating to the 'Hyderabad Funds' which is currently valued at 35 million pounds. It is understood that the legal costs of the respondents - Govt of India, the National Westminster Bank and the Nizam's heirs Mukkaram Jah and Muffakham Jah - are approx 400,000 pounds. Of this India has been paid 150,000 pounds, the National Westminster Bank 132,000 pounds and the Nizam's heirs about 60,000 pounds each respectively. The immunity waiver under the verdict, which has opened the doors for India to recover the frozen funds through legal process, is irrevocable. It is also stated that the Indian government and the heirs of Nizam are holding consultations on the subject. Newspaper reports suggest that this case, known as the 'Hyderabad Funds Case', relates to transfer of 1,007,940 pounds and 9 Shillings to a London bank account in the name of the High Commissioner in the UK for the then newly formed state of Pakistan, Habib Ibrahim Rahimtoola, at the Westminster Bank (now Natwest) in 1948. The money was transferred by an agent who appeared to be acting on behalf of the absolute ruler of one of the largest and richest of the Indian princely states, the seventh Nizam of Hyderabad. Upon partition of the country, the Nizam of Hyderabad wanted to be independent. On Sept. 1948, Hyderabad was annexed to India and a couple of days later this transfer of money reportedly occurred. However, on 27th Sept. 1948, the Nizam sought to reverse the transfer claiming that it had been made without his authority. The Bank was unwilling to comply with the Nizam's request without the agreement of the account holder. Such consent was not forthcoming, and for a number of years matters remained unresolved. With Hyderabad being a part of the India, the Nation has been staking its claim over the money as it was State fund and not the private money of Nizam. The legal entanglement has remained elusive to settlement. The recent judgement in London’s High Court of Justice tilts the 67 year old case in favour of India. Over the years, when India had to deal with Pak bilaterally, because in 1957, Islamabad invoked its right to sovereign immunity from court proceedings in Britain. On the financial dispute, in 2013, Islamabad decided to claim the funds and reopened legal proceedings. The success through the legal route appears brighter. It is stated that the transfer of such a high amount was made without Nizam’s consent. In 1954 the matter reached the British courts after the erstwhile Nizam and the State of Hyderabad (part of India) challenged the transfer saying it had been done without the erstwhile ruler's consent. The matter went to the House of Lords. In 1957 the House recognized Pakistan's right to invoke sovereign immunity but noted that legal proceedings to determine ownership would now be blocked forever. In 2013 Pakistan filed a legal claim against the National Westminster Bank for full recovery. There were reports suggesting that the members of Nizam family had written to Pakistan President Asif Ali Zardari, urging him to reciprocate to India's offer of an out-of-court settlement. Immediately after the transfer, India raised an objection to the transfer, saying the Nizam was not an independent ruler and prevailed upon the bank to freeze the account. Since then the matter is hanging fire. In 2008, reportedly, Indian government decided to pursue an out-of-court settlement with Pakistan and the heirs of the Nizam. The cabinet took the decision after Nizam's descendants met Prime Minister Manmohan Singh and then foreign minister Pranab Mukherjee. A cultural advisor to the Nizam’s Trust was quoted as saying that Nizam's heirs may get 20 percent of the money while the lion's share will go to India. Of the Nizam's 34 children, two sons and three daughters are still alive while there are a total of 104 grandchildren. In India, the Privy Purse was a payment made to the royal families of erstwhile princely states as part of their agreements to first integrate with India in 1947, and later to merge their states in 1949 whereby they lost all ruling rights. In 1947 there were more than 560 such princely states in India, and by the eve of independence, most of the States signed Instrument of Accessions to India Kashmir, Junagadh and Hyderabad were integrated later. In 1949 they were all fully merged with India to form new states. The motion to abolish Privy Purses, that had been defeated in Rajya Sabha earlier was successfully passed as the 26th Amendment to the Constitution of India in 1971. The then Prime Minister Mrs. Indira Gandhi argued the case for abolition based on equal rights for all citizens and the need to reduce the government's revenue deficit. The last ruler of Nizam was Mir Osman Ali Khan between 1911 and 1948. During his days as Nizam, he was reputed to be the richest man in the world, having a fortune estimated at US$2 billion in the early 1940s. The Nizam's vast inheritance was accumulated as mining royalties. The proposal for independence was rejected by the British government, then the Nizam opened negotiations with the Government of India ; concurrently encouraged the activities of the Razakars. The Nizam cited the Razakars as evidence that the people of the state were opposed to any agreement with India. Ultimately in a swift battle, the Nizam soldiers and Razakkars gave up easily. The Indian common man are not fully aware of the fact that so many crores of State’s funds were transferred in favour of Pak [later disputed by Nizam] and frozen in bank due to the legal battle. 1629 km is the distance from Hyderabad, India, to Lahore, Pakistan and .. 6707 km is the distance between New Delhi to London. 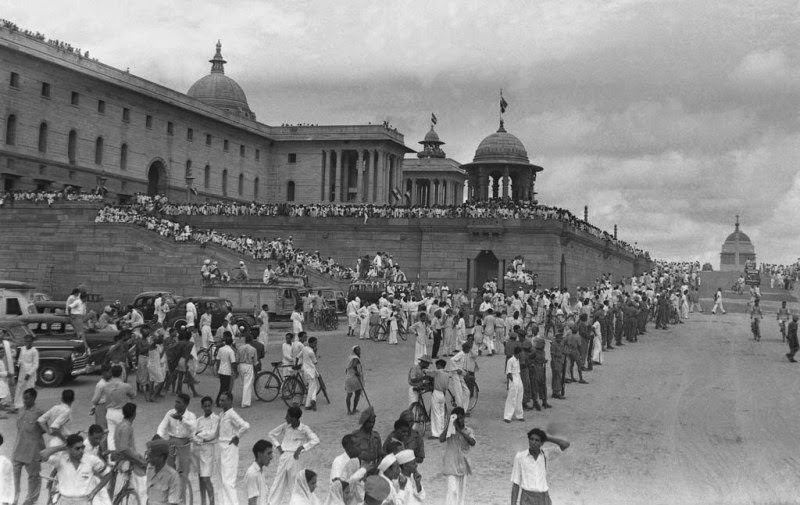 Photo of Indian Independence in 1947 – source and ownership of photo not known. If violating any copyright, will be removed immediately upon info. Many take delight in calling Proteas ‘chokers’ and they did nothing to change that tag today ! In the 1st Prudential World Cup 1975, NZ started with a bang – Glenn Turner scored 171 against East Africa and another ton against India. In the Semis, they were put into bat by Clive Lloyd. Glenn Turner (36 from 74 balls, 3 fours) and Geoff Howarth (51 from 93 balls, 3 fours) fell, breaking a second-wicket partnership of 90 runs, New Zealand lost 9/60 to fall to 158 (all out, 52.2 overs). Alvin Kallicharan made 72 off 92 eliminating the Kiwis. In 1992, Pak defeated the tournament favourites New Zealand in a high scoring match. Inzamam ul Haq smashed 60 off 37. It was the WC whence SA were robbed by rain rule ! Today, when SA batted runs were not coming freely. Amla was out early and Faf Du Plessis made 82 off 107 – he was too slow in the initial stages. With AB de Villers and Faf Du Plessis at the crease – a score over 300 looked likely….. but that would have been chased in 50 overs. It did rain after 38 overs with SA at 216/3, the match was later reduced to 43 overs a side. David Miller played a cameo 49 off 18; Ad de Villiers from 60 off 38 ended 65 off 45 ! In the end SA made 281/5 in 43 overs and DL rule set the target at 298 in 43 ~ actually, 297 would have sufficed, as a tie would have still taken NZ to finals. McCullum gave a real flying start – shredding the attack especially Vernon Philander – a 22 ball 50. Once he got out, wickets kept falling, SA fielding was impressive – boundaries were hard to come by. It boiled down to 46 off 31 balls when Anderson top-edged high into the night sky and perilously close to the Spidercam wires which would have made it a dead ball. 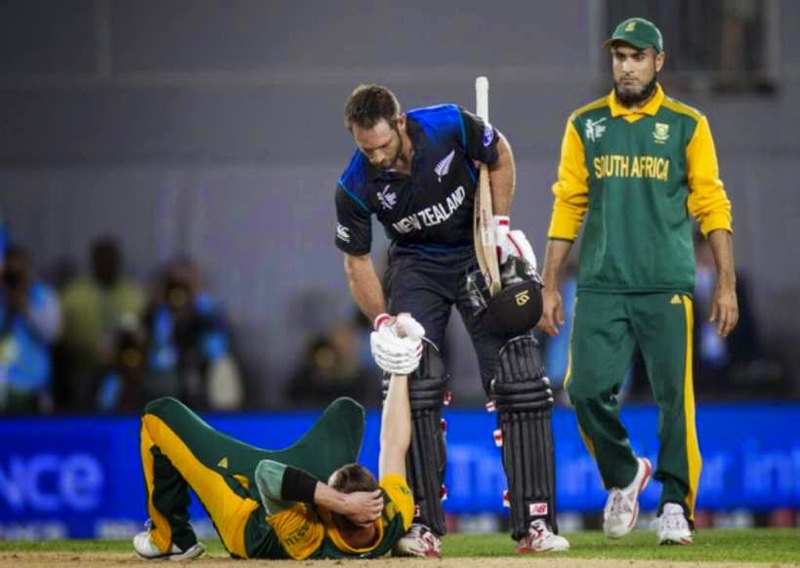 Luke Ronchi followed and in walked the 36 year old Daniel Vettori, and at that stage, one felt the match had drifted away from the Kiwis. Then came the fielding lapses. De Villiers fumbled a run out – at 40.3 Elliot ran mad – the throw was good – not the keeper, who disturbed the stumps without collecting the ball. At least twice, the Kiwis ran when the ball was in keeper’s gloves and the throw never was on target. Then a high catch went abegging. JP Duminy dived in the way to prevent Farhaan Behardien – though it appeared that Behardien had already spilled by that time. End of over 41 23 off 12 balls ~ still many fancied only SA. The last over target was 12 and with Dale Steyn, it seemed – all over. Vettori, in between ran hard, having placed a four earlier. The 5th ball of the over soared over long on – a mighty hit by Elliot, putting many SA on the ground weeping. Jubilation for New Zealand. Fireworks in the air. Tears at the ground. The hero with that six and Man of the match - Grant David Elliott, was born in Johannesburg, Transvaal; left his native South Africa in 2001 looking for new horizons, and found them in March 2008 when he was named in New Zealand's 13-man squad for the first Test against England at Hamilton. He won his first Test cap in the final Test after Jacob Oram picked up an injury, but struggled to make an impression with one wicket and two batting failures. Today, he played the innings of his life and would be remembered for long long time to come. Elliott pulled an injured Dale Steyn high over mid-on to ensure New Zealand's adventure would stretch all the way to Melbourne. New Zealand in finals for the first time and whom would they face would be known by Thursday ! dynastic politics ...... .. .. in Zimbabwe !!! World Cup is heading for the grand finale ~ the top 4 teams are in the Semis. In Match no. 30 of the WC [ODI 3627] between Ireland and Zimbabwe played at Hobart. 332 was the target, which Zimbabwe chased almost successfully. At death, it was ‘7 to win off 6 balls – 2 wickets in hand’. Much controversy was stoked by that catch of John Mooney. Had the umpires called it a six, Williams would have had a hundred, and Zimbabwe would have been favourites to win. Against India at Eden Park, Zimbabwe batted - Brendan Taylor played a great knock. There have been retirements of top players – some went over the hill and people started asking why still – very retired at peak. Taylor turned 29 last month. He is at the peak of his quite considerable batting prowess, and after 11 years retired due to that Kolpak deal ! ~ and that has a lot to do with the political situation prevailing there too. Robert Mugabe, who has been globe-trotting almost weekly since December last year, is reportedly set to leave for Algeria on a State visit this week before flying to Ethiopia on African Union business. “I want to thank you all for coming I was disjointed, we came back at midnight so I had two hours of sleep and naturally, I have the habit that if I have something that worries my mind, my mind sleeps on it and I constantly jump out of sleep and say is it not time, is it not time. That is why we were a bit late,” Mugabe said. The President’s admission of fatigue came as speculation was rife last week that his ailing wife, First Lady Grace had also reportedly slipped out of the country to seek medical attention. Robert Gabriel Mugabe (1924) is the current President of Zimbabwe, serving since Dec 1987. As one of the leaders of the rebel groups against white minority rule, he was elected as Prime Minister, head of government, in 1980, and served in that office until 1987, when he became the country's first executive head of state. He has led the Zimbabwe African National Union – Patriotic Front since 1975. Mugabe rose to prominence in the 1960s as the leader of the Zimbabwe African National Union (ZANU) during the conflict against the conservative white-minority government of Rhodesia. Mugabe was a political prisoner in Rhodesia for more than 10 years between 1964 and 1974. Soon after independence Mugabe set about creating a ZANU–PF-run one-party state, establishing a North Korean-trained security force, the Fifth Brigade, in August 1981 to deal with internal dissidents. Between 1982 and 1985 at least 20,000 people died in ethnic cleansing and were buried in mass graves. Mugabe consolidated his power in December 1987, when he was declared executive president by parliament, combining the roles of head of state, head of government, and commander-in-chief of the armed forces, with powers to dissolve parliament and declare martial law. An article says that political families are not a new concept in the United States and that people are used to seeing the children and relatives of leaders as perspective heirs since the founding of the country. From the expectations held by John Adams’ son John Quincy Adams to giant political families like the Tafts, Roosevelts, and Kennedys, throughout their history, people have held high political expectations for the children of political elites. The heirs have been seen as obvious successors in the world of politics; thinking that they will be able to make the same level of impact as their relatives solely because of who this next generation is related to. It does not need any articulation to say of India. Since Independence of the Nation in 1947, the Gandhi family [actually that of Nehru] has been in power for the major portion. The Congress may have lost the recent election, but dynasties are alive and well in Indian politics. A Times of India article immediately after the General elections stated that in the current Lok Sabha, 22% of MPs and 24% of cabinet ministers have had family precede them in politics. The leaders of 13 of the 35 parties in this Parliament were preceded by a family member; the leaders of another 10 have family following them into politics, bringing the total of family-based political parties to a whopping 66%. It is true that with the majority of seats won by BJP, dynastic representation in parliament has declined. Nevertheless, there is significant presence in BJP too. 48% of the 44 Congress MPs in parliament have a dynastic background, …… and there needs to be no comment on the heirdom of Tamil Nadu or the neighbouring Andhra Pradesh. Away in Zimbabwe, news is rife that Robert Mugabe is planning to name his daughter as his successor; especially due to the illhealth of his wife. 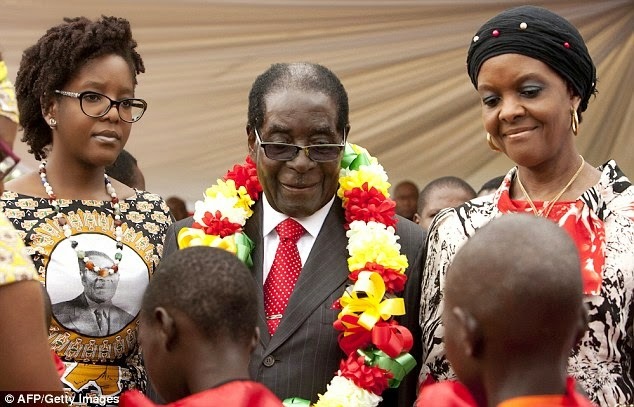 24-year-old Bona Mugabe-Chikore was born to president's first wife Sally; she has accompanied Mugabe on recent diplomatic trip to meet Japan's prime minister. Pictures of Mugabe and Bona in meetings with Abe, on the sidelines of the UN World Conference on Disaster Risk Reduction being held in Japan, have been splashed around the world over the past few days, raising eyebrows back home about whether the 91-year-old was turning Zimbabwe into a monarchy. MailOnline reports that there are fears inside Zimbabwe's that president Robert Mugabe wants to turn his dictatorial rule over the country into a monarchy - by getting his daughter to succeed him. He originally planned for his wife to assume the position of president after him but her worsening health has forced Mugabe to turn to his 24-year-old daughter Bona, according to the Times. Last year, Mugabe promoted his wife Grace to a senior position within his ruling ZANU-PF party where she led a vicious campaign to remove former vice-president Joice Mujuru from office. But the 49-year-old has fallen severely ill in recent months and she has been taking regular trips to Singapore for medical treatment. Bona gained a master's degree in banking and finance at the Management Development Institute in Zimbabwe two years later. Last year, she married an Emirates airline pilot Simba Chikore in a luxurious wedding ceremony in Zimbabwe. Her inclusion in the diplomatic mission to Tokyo also sparked widespread condemnation because many civil servants in the country have worked for months without pay. jucha libre fighter Aguayo is dead in midst of fighting !! and game continued !!! WWE, TNA, ROH and many more … all names of Wrestling shows that are shown on TV – not what you see in Olympics, Asiads and such International competitions – ‘wrestling manias’ promoted by many entertainment media. Ask your children of chokeslam; frog splash; brainbuster; taste of pain; sleeper with body scissors; tadpole splash; patriot lock; tombstone; 619; bombshell; bull hammer …… !! to parents such shows could be nauseating and would feel that their children should never see these shows; .. but children are already addicted to them. Lucha libre (meaning "free wrestling") is a term used in Mexico, and other Spanish-speaking countries, for a form of professional wrestling that has developed within those countries. Although the term nowadays refers exclusively to professional wrestling, it was originally used in the same style as the English term "freestyle wrestling”. WWE SmackDown is a professional wrestling television program for World Wrestling Entertainment (WWE). From January 15, 2015 the show was aired as WWE Thursday Night SmackDown. The show's name was also used to refer to the SmackDown brand, in which WWE employees were assigned to work and perform on that program during the brand extension period of 2002 to 2011; the other program and brand was Raw. Couple of months ago, Interactive announced WWE Immortals, a free-to-play mobile game developed by Mortal Kombat studio NetherRealm in association with Phosphor Game Studios. Due to launch worldwide in 2015, WWE Immortals is coming to iPad, iPhone, iPod Touch and Android devices. Pedro Aguayo Ramírez was a Mexican professional wrestler and promoter who achieved fame in lucha libreas Perro Aguayo Jr. or El Hijo del Perro Aguayo ("The Son of Perro Aguayo"). 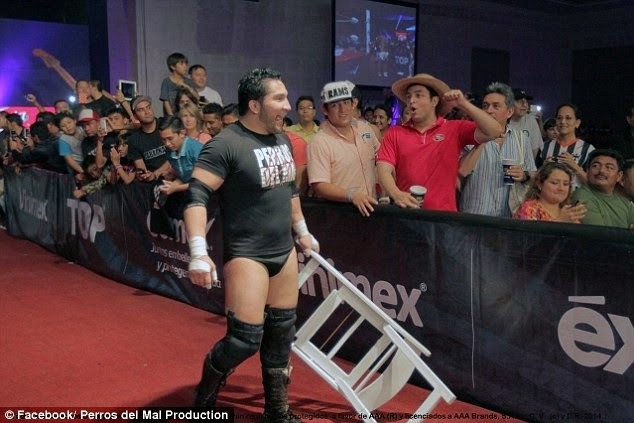 He was the real-life son of lucha libre legend Perro Aguayo and not a storyline "Junior". Born in 1979, he was – yes was, because today he is no more. Aguayo was best known as the leader of the Perros del Mal stable, which he started in Consejo Mundial de Lucha Libre (CMLL) in mid-2004. The stable became a significant draw in Mexican professional wrestling, peaking during Aguayo's storyline rivalrieswith Místico and Héctor Garza. The world of Mexican wrestling has been deeply shaken by the death of star fighter Hijo del Perro Aguayo, who collapsed after being kicked during a bout. 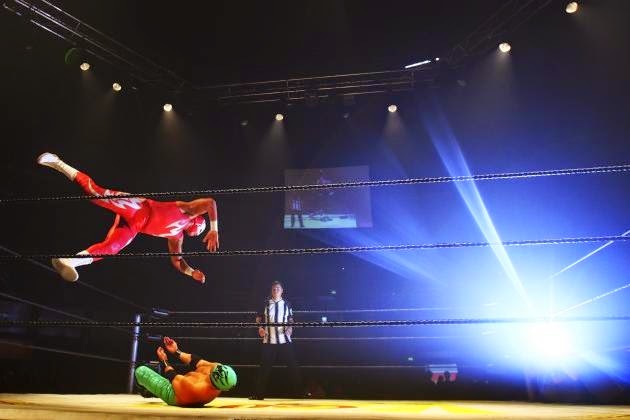 The lucha libre fighter, was left slumped against the ropes after a flying kick from one of his opponents, Rey Mysterio, during the match Friday night. The other wrestlers continued with the fight as Aguayo's limp body slid down onto the mat, according to video footage of the bout posted on social media. The video showed ringside personnel repeatedly shaking Aguayo and talking to him without any response. He eventually received medical attention and was rushed out of the arena in the city of Tijuana. With the Doctors unable to revive him. AAA, the wrestling promotion company for which Aguayo worked, said it was informed of his death around 1 a.m. Saturday. He was 35 years old. On that fateful day, Aguayo wrestled a tag match, teaming with Manik against Rey Mysterio Jr. and Xtreme Tiger at a show in Tijuana, Mexico. During the match, Mysterio used a headscissors takedown to propel Aguayo out of the ring, but Aguayo quickly returned to the ring, upon-which Mysterio dropkicked Aguayo in the back to set up for Mysterio's signature 619 as Aguayo landed throat-first on the middle rope. Manik then fell onto the middle rope to set up a double 619 spot, whiplashing the rope Aguayo was resting on. At this point, Aguayo appeared to be limp. Mysterio performed the 619 and did not hit any opponent. The match continued, but was quickly finished by Mysterio pinning Manik. Konnan attempted to revive Aguayo at ringside. Officials later brought Aguayo out of the ring. When paramedics arrived, Aguayo was brought to the local Del Prado hospital, where he was pronounced dead. According to the initial announcement from the hospital, Aguayo died from a cervical spine trauma, reportedly as a result of a dropkick ; at the time of the incident Aguayo was not immediately attended to by a physician and was actually taken from the ring on a piece of plywood instead of a stretcher, which lead to some criticism of the event organizers. The attorney general for Baja California announced that they would conduct an investigation into the death of Aguayo and the circumstances surrounding it to determine if there was the possibility of any criminal charges to be filed. Whatever could be the findings are, the Mexican wrestling star was dealt fatal blow in the ring in front of thousands of people... and the show kept going as he remained motionless on the mat for two minutes ~ and we call all these games and entertainment !! Óscar Gutiérrez, better known by the ring name Rey Mysterio, is a Mexican-American professional wrestler who currently works for Asistencia Asesoría y Administración (AAA). He is best known for his time in WWE. Tigre Uno is another Mexican professional wrestler currently signed with Total Nonstop Action Wrestling. India has so far played classic Cricket and deservingly in the Semi finals – in fact – it boils to top 4 of the World. India has bowled out its opponents in all the 7 matches in this World Cup. Men generally do not cry and anyway cries do not take teams anywhere. 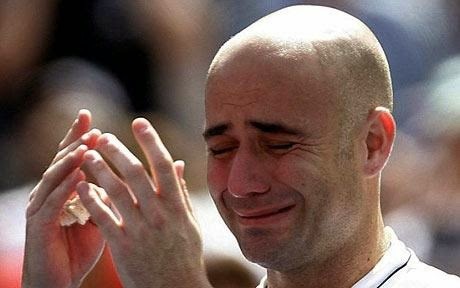 In Sept 2006, Andre Agassi walked off the court the way he wanted, to a champion's ovation. A career for the ages came to a close with Agassi worn down and wincing, losing to 112th-ranked Benjamin Becker 7-5, 6-7 (4), 6-4, 7-5 in the third round at the U.S. Open. Betrayed by a creaky body that needed four injections this week, his spirit never waned, Agassi was seen weeping inconsolably …. World Cup umpires have been left seething over an attack on their integrity by one of the International Cricket Council's most senior figures, and could take what would be extraordinary legal action against one of their own. Privately, the umpires – Englishman Gould and Pakistan's Dar – were furious, believing the remarks to be defamatory. The option of whether to sue Kemal over the post-match spray was discussed. Kemal, a former Bangladesh Cricket Board president, assumed the ICC presidency from New Zealand's Allan Isaac last June. The position is largely ceremonial. Kemal said he would raise his complaint with ICC management. Umpiring mistakes do happen…. In the first match of this WC, James Taylor was denied a maiden international century by an umpiring error. In Feb 2012, India tied with Sri Lanka in the One dayer at Adelaide, but their 30th over contained just five deliveries. In Jan 2008 Umpire Steve Bucknor at Sydney in the 2nd Test, had reprieved Andrew Symonds after he got a huge nick off Ishant Sharma, chose to help the all-rounder again by spotting a non-existent edge off Dravid's bat. The Test was also marred by poor umpiring from Mark Benson, who didn't give Ponting out caught behind, and third umpire Bruce Oxenford, who didn't rule Symonds out stumped. In 2011, in a cruel joke on the Indian skipper MSD, the third umpire officiating in on the first day of the second Test at the Kensington Oval - Gregory Brathwaite - was shown a wrong replay of Fidel Edwards' delivery stride after he dismissed Dhoni off a delivery. On-field umpire Ian Gould asked for confirmation of his decision that the delivery was a no-ball, but the host broadcaster made a silly mistake and showed the umpire a different replay, of another delivery from Edwards, which naturally wasn't a no-ball. So, Brathwaite wrongly judged Dhoni out caught at mid-on in the 59th over of India's first innings. Upon review, IMG Media - the host broadcaster - admitted to ICC that the delivery that led to Dhoni's dismissal should indeed have been called a no-ball. All these were at best [at worst] blunders on field, none blamed the system or said they were pre-arranged. The match is not happening in India, the Umpires are not Indians. Aleem Dar is from Pakistan and IJ Gould is from England. The TV Umpire - SJ Davis was born in London and is an Australian. Incidentally, Steve Davis [along with Simon Taufel] was thre at Lahore when terrorists spilled bullets. The match referee was Roshan Mahanama from Sri Lanka and Reserve Umpire was Paul Reiffel, Australia. 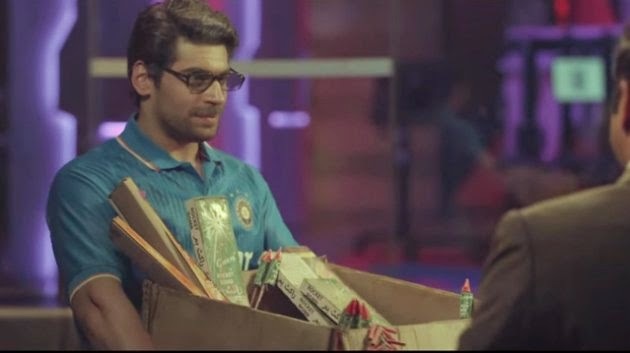 ‘Mauka, mauka’ ad campaign of Star Cricket is almost ended….. the first in Series was of Pak fan in Karachi waiting since 1992 to burst crackers and celebrate victory over India in a World Cup. Pak has lost to Australia in the WC 2015 and Aussies would meet India in the Semis – NZ have also stormed to Semi and would play SA. The Pak fan will have to wait for 4 more years and worser still, if in the next itinerary – India and Pakistan are not in the same half. According to the Motor Vehicles Act - ‘Carrying capacity’ (in Public transport vehicle) means the no. of seats plus the standees authorised as part of carrying capacity and excludes the seats allotted to the operating crew. Standees would mean the no. of persons permitted to be carried in the bus over and above the no. of seats. The MV Act prescribes that only 25 standees are allowed in stage carriages and this would be clearly specified in the permit. Those who flout the provision could face imprisonment or fine as also cancellation of the route permit. …and it is common knowledge that in bustling cities, there are so many persons standing in vehicles ! On a different plane the noun ‘Stand-off’ would mean a situation in which one force or party neutralizes or counterbalances the other and further action is prevented. A Standstill is a stand-off between demonstrators and the Police. There have been advertisements – Fewiquick commercials have attracted viewers. A few years back, a cool fisherman unlike others would apply drops of feviquick to his fishing rod – it was a hit showing the man with his emotions able to catch fish faster and easier than the others waiting nearer ! 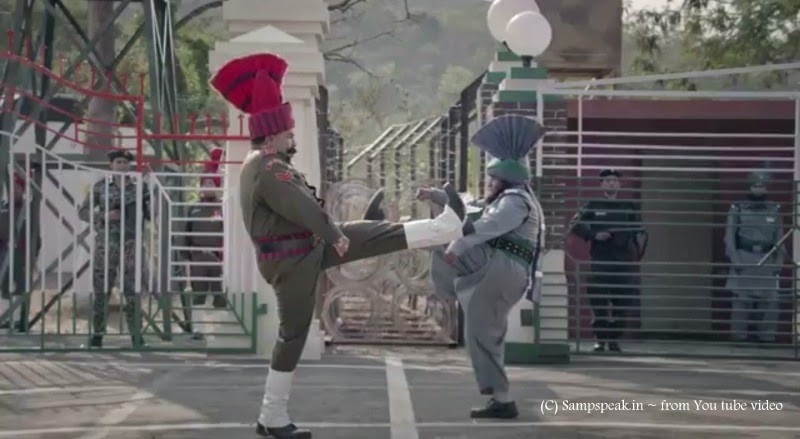 Now in the recently launched Video series, in the ceremony of Indo Pak soldiers, the Pak man lifts his leg and is shown a torn shoe, which is quickly placed back with feviquick touch of Indian soldier without making others realise ! Though with no direct correlation to all the above – how comfortable are you in travelling standing in a bus or a train ? ~ in OMR and in all other city roads, as also in trains, there are milling crowds and people do not mind standing [not that they have any option !]…. Often they say in comparison, that in planes one cannot be asked to get down midway and one cannot stand during the travel ! – perhaps the latter too could become a thing of the past. 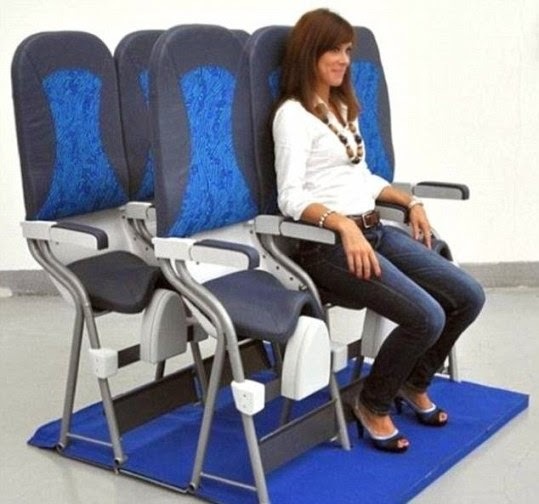 News reports suggest that Chinese budget carrier plans 'vertical seats' for flights (and claims it had the idea before Ryanair. Spring Airlines said it would offer cheaper fares for those willing to stand. Chairman Wang Zhenghua said he began looking at the concept in 2008…….. Shanghai-based budget carrier offers one-way fares as low as £1 ($1.50) ~ it is stated that Ryanair floated the idea in 2009 but its attempt was stopped by a regulator. China’s first budget airline is poised to lobby industry regulators for permission to install standing-only ‘seats’ on its planes so it can cram more people on board. Shanghai-based Spring Airlines said it would offer cheaper fares to those who are willing to stand at a vertical seat, according to China National Radio. It’s not the first time the idea has been floated – Dublin-based Ryanair famously proposed selling standing-only tickets in 2009 to increase passenger traffic and cut costs. China's Spring Airlines wants to install 'vertical seats' on its planes so it can cram more passengers on board. Customers told China National Radio that they would be hesitant to buy a ticket for a vertical seat out of safety concerns. One told the broadcaster that she fears passengers would be injured when the plane flies through bad weather or is rocked by turbulence. Even though designs have been proposed and no-frills airlines have expressed interest, the vertical seat concept has not taken off because it hasn’t received approval from authorities. Ryanair abandoned its proposal in 2012 after it was thwarted by an unnamed regulator. The Irish carrier planned to install ten rows of vertical seats on its planes – increasing capacity by about 40 passengers – and charge less than £5 to travellers who were willing to stand. Airbus filed a patent for a new seat that is similar to a bicycle saddle that flips up when it is not in use. Italian firm Aviointeriors designed the ‘Skyrider’ seat, which was inspired by saddles used by cowboys. The design, intended for short-haul flights, would increase capacity for airlines and leave passengers with even less space. In that seat passengers would sit at an angle with just 23in of legroom between them and the seat in front of them – about seven inches less than the average seat pitch on most planes. So standees on a seat in air – sounds bundle of contradictions, yet could become a reality. Source http://www.dailymail.co.uk/travel/ - 15th Feb 2015. March – April is examination time – anxious time for parents, especially whose wards are appearing for Public exams and some of them are expressive of the Cricket World Cup happening at this crucial time. A day after the mathematics paper of the Class XII Central Board of Secondary Education exam was reported to be the toughest in 10 years, the Board held a meeting with some of its affiliated schools. The Board was reported to be considering making the marking more lenient than before. In the exam conducted on Wednesday, students had panicked seeing a paper with a changed pattern. There were also rumours rife about the question paper being mistaken for the IIT Joint Entrance Examinations paper. Although there was no official statement from the CBSE, agencies reported that the Board might have an evaluation committee take stock of the students’ grievances to decide if grace marks could be awarded. This is not entirely new or the first time – students indulging in cheating / malpractice – carrying small bits providing gist of answers is also not unheard of – all along, these were considered to be few and far and done by those not considered good. It places such errant students above those who had worked hard has been a sad reality too. 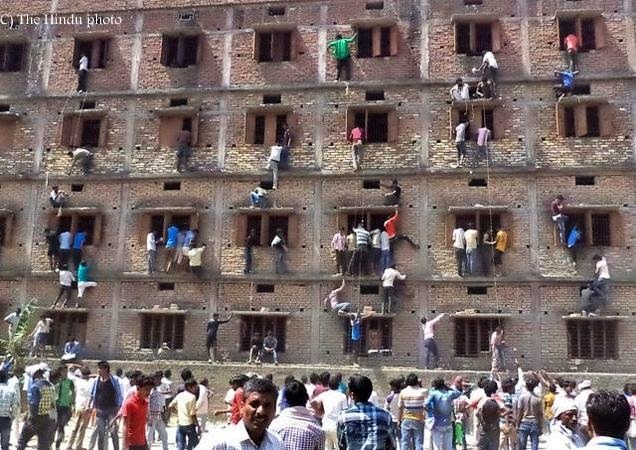 Now suddenly, the photo of parents climbing the examination hall walls like mountaineering experts has gone viral ! India Today screamed ‘in Bihar, this is called reaching Greater heights’ and the photo had its reverberation globally appearing in Telegraph UK and other papers too. The news ridiculed stating that in olden days, parents came to school to give tiffin boxes and now they climb to pass on chits ! The system of education is pretty complex; the school system has an array of differently structured systems. For some children of the city, education starts at age 3, from when on parents goad them to tough levels, demanding them to do whatever they were unable to do, putting them to grind by enlisting them in too many courses, tuitions, and extra-curricular activities. Now a days, it is becoming increasingly difficult to find normal children – children are not allowed to play – but watch lot of TV programmes and attend too many classes. For the empty prattle, vanity and boasting of parents – children suffer. The Kamal Prabhu Prakashraj starrer Vasool Raja MBBS was a hilarious comedy. Rajaraman, a small time don gains admission in Medical college by forcing Dr Margabandhu [Crazy Mohan] to impersonate and write exam his behalf. [98.3 ….. and How do I know Sir !!] … then when a tough internal exam is set, Kamal writes the exam with the help of Crazy Mohan through Bluetooth ! In Sankar’s Robot – Enthiran with the storyline of Sujatha, Chitti helps Sana [Aishwarya Rai] first by voice and then by emitting the visual images of books reflected near her. A couple of years ago, the shameful incident of a school in Thiruvannamalai - Mount Saint JosephMatriculation Higher Secondary School (known as Mount School) caught in the shameful act of organised copying resulting in suspension of 7 teachers, Principal of the school being relieved of examination duty caused sensation …. In an incident beating them all, the phenomenon of mass copying being helped by family members of the students taking board exams is doing rounds. In the pictures circulated, family members are seen deftly climbing buildings in broad day light to pass them chits so that they can cheat. More shocking is the fact that such incidents take place on a large-scale and open manner despite inspection authorities and police personnel being posted outside the exam venues. The situation is so bad that the State's minister of education PK Shahi admitted that cheating-free examinations were not possible in the state. The exasperated minister told the media, "The government cannot stop cheating in exam... It is also the responsibility of the society to ensure a cheating-free exam. More than the government, the parents and guardians of students should come forward (to end mass cheating)." Lalkeshwar Prasad, Chairman of the Bihar School Examination Board, visited the centre at Mahnar in Vaishali district, but he and his colleagues faced the wrath of parents and others. It is stated that the friends and relatives of examinees often hurl stones at authorities deputed to stop unfair means at the centres. They bribe policemen and teachers to pass on chits to their wards. “If we try to stop unfair means at a centre, friends and family members of the examinees gang up to intimidate us,”a schoolteacher is quoted as saying. Ehtiopian hijacker sentenced 'in absentia' ..
farmers frown as Jasmine price nosedives !! Niagara - are the falls really frozen ? ?